Dr. Danielle graduated from Colorado State University in Ft. Collins, CO. in 2002 with a Doctorate degree in Veterinary Medicine. In 1998 she received her Bachelor of Science Degree in Microbiology from Colorado State University as well. Dr. Danielle has had a fascination with animals since she was about 2 years old, and was volunteering for a local veterinarian in Colorado when she was just 13 years old. Having grown up with a number of family pets Dr. Danielle learned by example, from her parents, that kindness and respect are essential in any human-animal relationship. Dr. Danielle has always been involved with animals in one way or another. Her professional career has taken her down many roads including experience as an animal protection officer, dog and cat behavioral training, rehabilitating wildlife, and working as a research associate for the Centers for Disease Control (CDC). More recently, Dr. Danielle was the full time Medical Director for VCA Stanford Palo Alto Veterinary Hospital. And she continues to offer high quality veterinary medicine services to four other veterinary emergency hospitals in the San Francisco Bay Area. 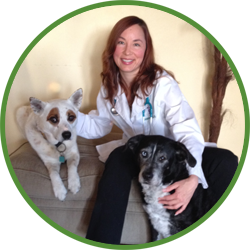 In her free time, Dr. Danielle enjoys hiking with her 11 year old, rescue border collie named Jade. She also rides horses, works on stained glass projects and exercises as often as she can. "Of all the things I've done in my life, nothing gives me more satisfaction or pure delight than helping animals live the longest, healthiest, and most joy filled lives that they can."